I read rave reviews about this book in a newspaper book review section, immediately raising my curiosity to read it. A couple more good words on the book and I wasted no time in buying the book. So so totally worth the read. While reading this rather small book, one gets to know the large grit that the author had. Yes, “had”. As she is no more. Aisha Chaudhary was born with S.C.I.D (severe combined immune deficiency) and underwent a bone marrow transplant when she was 6 months old. 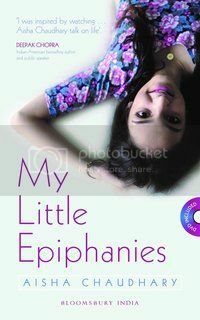 Shesadly passed away on the morning of 24 January 2015, the very day her book, My Little Epiphanies, was launched at the ZEE Jaipur Literature Festival. She was 17 years old. This book stands tall in front of all the many books written by similarly aged teenagers. This book is her way of letting her thoughts away from the pain and the misery she has always been in. Spending most of her time lying on the bed, this book is about a lifetime of her experiences. This book is full of honest, mischief, kindness, pain, hope and above all love. Reading this book makes one feel how little our life and problems are compared to what this young girl went through in her short but eventful life. One statement which is echoed throughout the book, and something that I have always attempted to live by, “We should be happy about the things we can do instead of being sad about things we are not capable of”. Her beautiful doodles and short poems so well capture the myriad of emotions she goes through while she battles this monster of a disease and how she does it all with a smile on her face. Aisha has surely left an indelible memory in my mind, and I strongly recommend this book to anyone interested to learn about life.